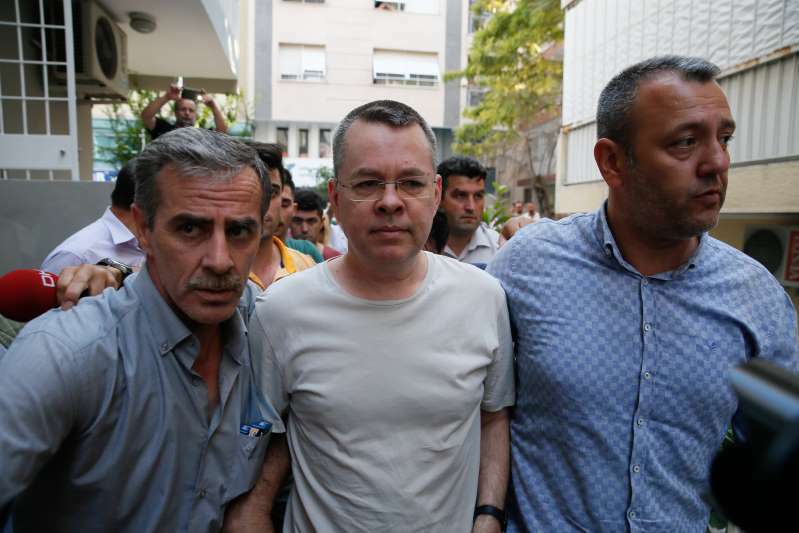 American Pastor Andrew Craig Brunson (C), who was charged with committing crimes, including spying for the PKK terror group and the Fetullah Terrorist Organization, arrives at the address, which he was put under house arrest due to his health problems, in Izmir, Turkey on July 25, 2018. U.S. President Donald Trump on Monday ruled out making any concessions to Turkey to gain the freedom of a detained American pastor and said he was not concerned that retaliatory tariffs he imposed will have a ripple effect and hurt the European economy. Trump, speaking to Reuters in an Oval Office interview, said he thought he had a deal with Turkish President Recep Tayyip Erdogan when he helped persuade Israel to free a detained Turkish citizen. He had thought Erdogan would then release pastor Andrew Brunson. Trump has imposed tariffs on imports of Turkish steel and aluminum in response to Erdogan's refusal to free Brunson, raising concerns of economic damage in Europe. [post_ads]Trump and Erdogan met in Brussels for a NATO summit in mid-July where they discussed Brunson’s case and what could be the way forward to release the pastor, a senior White House official said earlier. Trump had suggested earlier this month he would be willing to meet Iranian President Hassan Rouhani if the Iranians wanted to discuss the dispute over Iran's nuclear program. The Iranians, including Supreme Leader Ali Khamanei, have shrugged off the offer. Asked to respond to Iran's refusal to meet, Trump said it not matter to him whether they met or not.